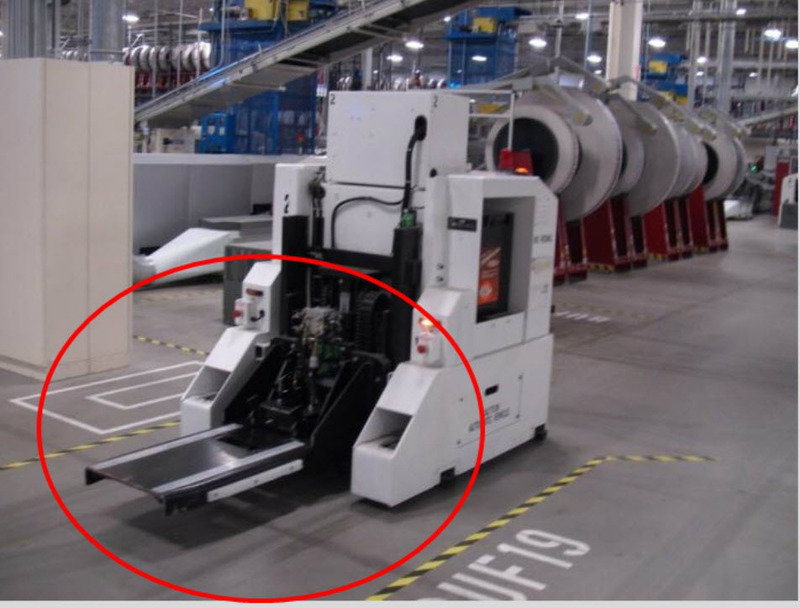 AGV is an acronym for automated guided vehicle. AGVs are computer-guided, wireless, battery-operated vehicles that move pallets and reels around in the warehouse as needed. There are two different types of AGVs used in the warehouse. One type is designed to move pallets and the other type is designed to move reels. 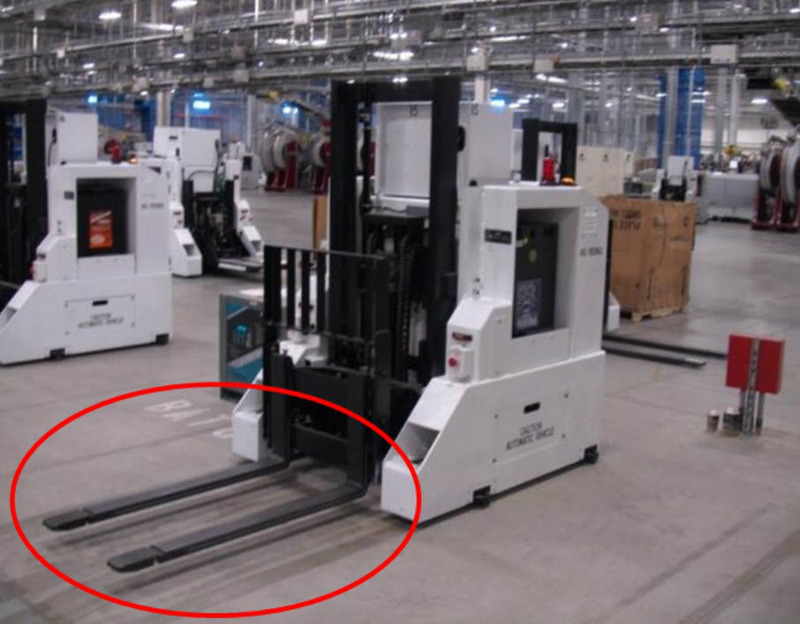 The pallet AGVs have a device attachment identical to any standard forklift. They weigh about 6,400 pounds with the battery and can lift up to 3,000 pounds of weight. The AGVs are designed to move as fast as 200 feet per minute or 2.3 miles per hour. The reel AGVs are identical to the pallet AGVs with the exception of the attached device, which moves a reel instead of a pallet. The reel AGV weighs about 5,700 pounds with the battery and can lift up to 3,000 pounds of weight. Knowing the orientation of the AGV is beneficial when discussing the left or right side of the AGV or the front or rear of the AGV. The rear of the AGV is considered to be the side with the lifting forks. The front of the AGV is the opposite side with the manual controls on it. The left side contains the circuit breakers and the remaining side is the right side. Rear View – The housing for the hydraulic motor and solenoid valves sits on top of the AGV. The hydraulic cylinder that operates the pallet forks is located beneath the housing and behind the forks. Unlike some other forklifts, the pallet AGV can only raise and lower its forks. The AGV cannot extend and retract the forks. 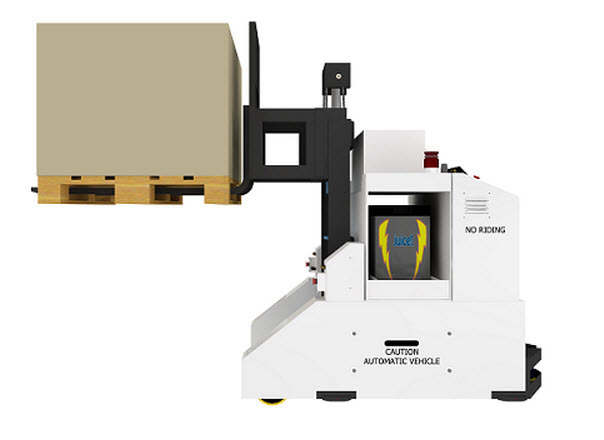 Left Side View – The AGV is battery operated and a 1,800-pound battery resides inside the AGV. The AGV is sent to a battery charging station when the computer detects that the voltage of the battery has dropped to a certain level. The battery is removed from the AGV and fully charged on a weekly basis. The primary and control circuit breakers are also shown in the picture. These circuit breakers isolate all of the electrical components in the AGV from the battery and should be opened before any maintenance is performed for safety reasons. Front View – The front of the AGV houses the manual controls and graphical display unit (GDU). The GDU is a touchscreen monitor that allows the operator to interface with the on-board computer system. All of the electrical components reside inside the electrical cabinet. The SICK 3000 PLS Scanner is a laser scanner that detects objects in the path of the AGV and will stop the AGV if any objects are too close. Bottom View – The AGV has two unpowered rear wheels. The drive wheel, also known as the traction wheel, has a motor connected to it for power. The magnet sensor detects the magnets in the floor and sends that information back to the computer for AGV guidance. The battery charging shoe meets up with the charging plate to allow the AGVs battery to be recharged while installed. The proper and automatic operation of the AGVs depends on several different systems. Computer Networks – Two separate computer networks are needed for the proper operation of the AGVs. The factory network interprets the inputs and outputs from the various stations throughout the warehouses and then relays the information to the AGV controller. The AGV controller decides which AGVs will perform certain tasks and then uses the AGV network to instruct the individual AGVs. Each AGV is equipped with a computer that receives a wireless signal from the AGV controller. Navigation – Navigation is the ability of the AGV to know its current location and plot the path to get to the next desired location by referencing a map of the warehouse. Guidance, on the other hand, is the act of following the path once the path has been chosen. Some of the components used in the navigation of the AGV are incremental and absolute encoders, such as a gyroscope, magnets buried in the floor of the warehouse, specially designed software, and a computer. Guidance Feedback System – The AGV’s navigation system takes all of the inputs from the various sensors and calculates its best possible location. The computer compares this best possible location to the “ideal” location, and the Guidance Feedback System is used to make minor corrections to guide the AGV toward the “ideal” location. Magnets and Map – Magnets are installed in the floor of the warehouse. The location of each is entered onto a database map that is stored on the AGV’s computer. This map is used in navigation to help the AGV know where it is currently located, where the next destination is, and the best path to get there. Battery Charging System – The AGVs get their power from a large battery inside the AGV. During normal operation, if the AGV controller detects that the AGV’s battery is below a certain voltage, it will send the AGV to a battery charging station. The charging shoe on the AGV will make contact with the charge plate, located in the floor of the warehouse, and allow the battery charger to activate and recharge the AGV’s battery. The expert consultants at Technology Transfer Services are available to assist you with anything warehouse related, including AGVs. We can design custom preventive maintenance programs, or improve existing ones, to ensure that your warehouse runs at maximum efficiency. Give us a call today at (813) 908-1100.